This is my version of a popular recipe I found online. My original thought was to make a dip for pretzels. You have onion dip for the bowl of potato chips, and so I figured we needed a dip for the bowl of pretzels. Am I right? I do love the really thin ones, but the larger pretzel rods seemed to be calling me for this particular dip. But then I talked to my brother Denny, and also to my friend Donna Marie, and they both suggested that it should be served with SOFT pretzels instead. Hmm...not a bad idea! After all, I do love to serve Spinach Dip with broken up soft pretzels! 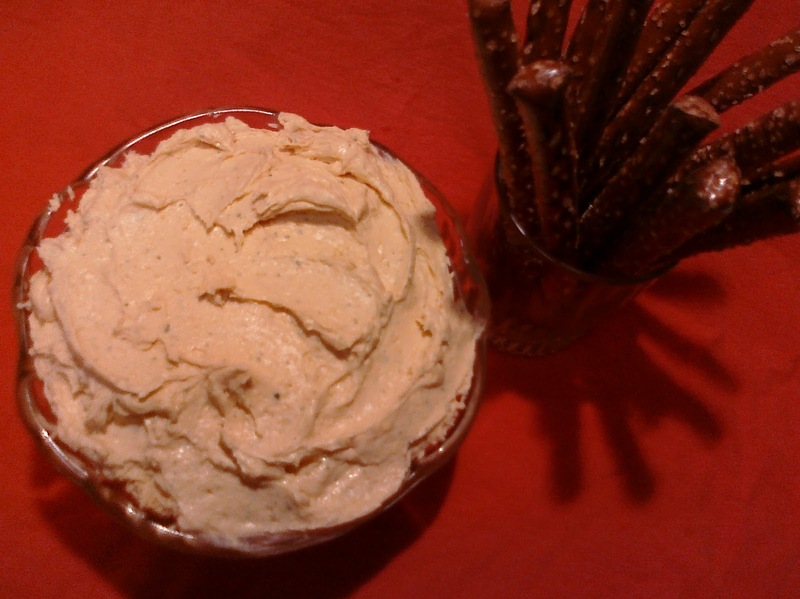 Still, there's just something about that pretzel rod CRUNCH that I'm loving with this dip. Well, whichever pretzels you choose to serve, I'm sure you're party guests will love it. Make it ahead and serve it for your next sports party or tailgate event! As Jerry described it, 'it's addicting!!!" Place all ingredients in a food processor with a metal blade and process until smooth. Drink the rest of the beer. Cover and place in the fridge for a few hours before serving. Serve with pretzel rods, or your favorite kind of pretzels. If you don't have a food processor, you can just bring everything to room temperature and mix it together with a mixer. The dip won't be smooth, but it'll still be yummy. Use any kind of beer you like. Usually, when using beer in a recipe, it's better to choose a heartier dark beer or stout. I think the flavor is quite good as it is, but if you want to pump it up even further, feel free to add finely chopped green onions and/or fresh minced garlic. Can be made well in advance, even up to several days before your event. Just keep it tightly covered in the fridge.